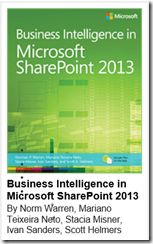 I just received my copies of Business Intelligence in SharePoint 2013. I will be signing the books and giving them away at the next SharePoint Saturday 2013 in Redmond where I am speaking. Being an Author and writing a book is very time consuming and can be difficult since you are working with software that is going to change many time’s prior to release and you are typically the first to be writing opn the new features being released. However, I was lucky enough to work with a few authors (listed below) who are all some of the best folks I have had the pleasure of working with, and I learned a lot about how much my writing needed to improve. 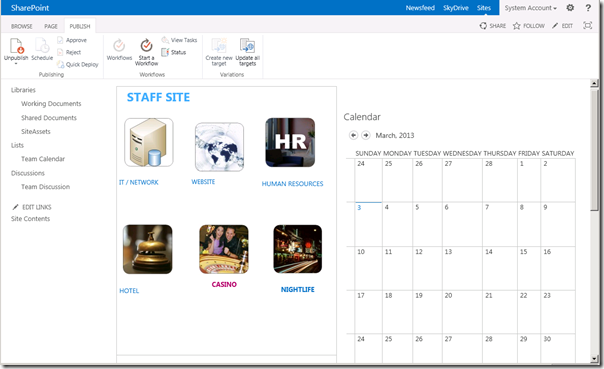 Dive into the business intelligence features in SharePoint 2013—and use the right combination of tools to deliver compelling solutions. Take control of business intelligence (BI) with the tools offered by SharePoint 2013 and Microsoft SQL Server® 2012. Led by a group of BI and SharePoint experts, you’ll get step-by-step instructions for understanding how to use these technologies best in specific BI scenarios—whether you’re a SharePoint administrator, SQL Server developer, or business analyst. I would also like to thank all of the wonderful people at O’Reilly and Microsoft Press for being there when we needed you…. § Top community speakers including big data ZDNet blogger Andrew J. Brust; BI experts Alberto Ferrari, Stacia Misner, Peter Myers, Marco Russo and Chris Webb; data mining and predictive analytics gurus Mark Tabladillo and Cristian Vava; data science expert Mark Whitehorn; and Decision Sciences professor, Mathletics expert, and two-time Jeopardy! champion Wayne Winston. 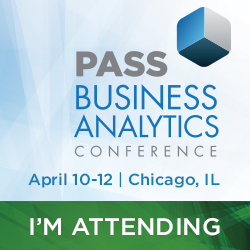 § Hear from the Microsoft experts: Kamal Hathi, Director of the BI Group for Microsoft SQL Server; Ashvini Sharma, Group Program Manager in the Office Data Experiences team; and Tim Mallalieu, Principal Group Program Manager for Microsoft HDInsight. Parallel Data Warehouse, and SQL Server. Prior to discussing the Visio Graphics Demo Builds I would like to say that it was a privilege to work with Mariano Teixeira Neto, Stacia Misner, Ken Brown, and especially Norm Warren who I owe the most gratitude for taking a non-author under his wing and somehow bringing me through the process. If you haven’t ever had the opportunity to write a book on technology of any kind prior to its release while maintaining your own business, it was a challenge to say the least. I worked more hours in the last 6 months than I would have ever thought possible. Business Intelligence in SharePoint 2013 is a great guide to the numerous Business Intelligence features to be found in the combination of SQL Server 2012 and SharePoint 2013. There were times, well most of the time I found parts difficult to write. In some ways I learned (always have know) I can build and automate anything. But what I didn’t know or have a clue about, though I have been writing technical guidance for years for clients is that when writing to a diverse audience you had better have folks on your team to learn from that have been there and delivered the end product many times before. My difficulty was due in part to the the diversity of the audience, I don’t think I am eloquent enough to write to a non-technical audience in any meaningful way. This may be due in part to being a geek and all I speak is geek. It may have been I was so impressed with the other authors work that it made mine seem to me sophomoric. 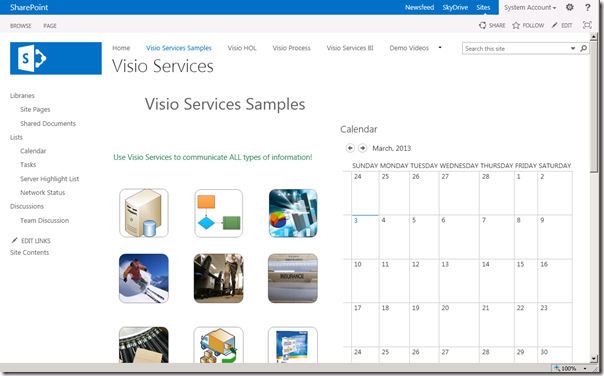 However, it was a great learning experience and allows me to share some pretty cool Demo Builds with you including this Visio Services Demo 2.0 Content Pack that you can download from Codeplex. http://SharePointDemoBuilds.codeplex.com. In addition, though this work has been modified so there isn’t any stuff that is broken. 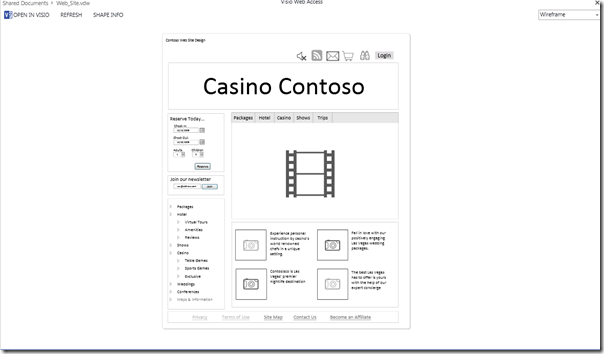 The diagrams broken or not have been around in many forms for a couple of SharePoint Releases. So, I would also like to thank Microsoft for providing these diagrams as learning tools and though I don’t know the folks directly who created most of the diagrams I have modified most of them, and left a few in lace for you to go through the upgrade process. I would just like to thank everyone involved that I haven’t mentioned previously from O’Reilly, Microsoft, and the folks that originally provided this collection of content. 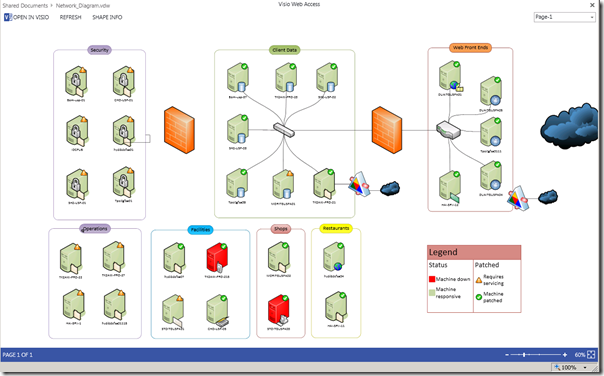 Though it is a work in progress it enabled me to learn Visio Services more quickly than I would have without having this work as a resource. 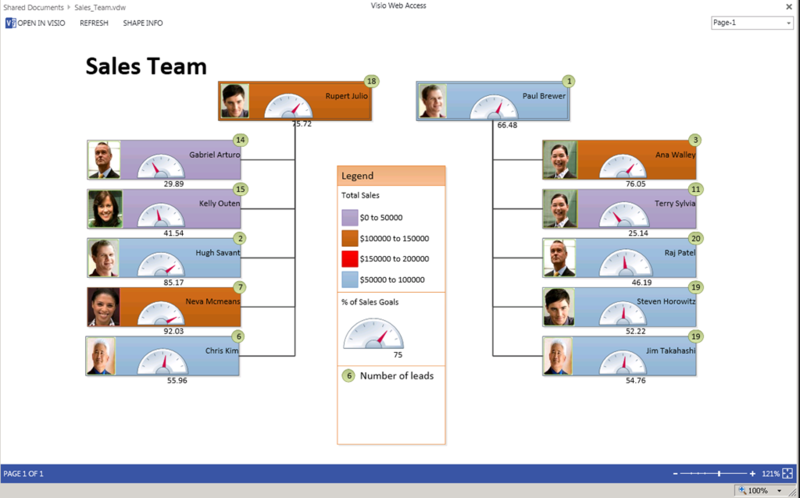 In summary this is a way to build not code Visio Diagrams and then add them to dashboards attached to live meaningful data., Because we know that executives love red Light, Green Light, Yellow Light and who they need to get in touch with to find out what’s up.. 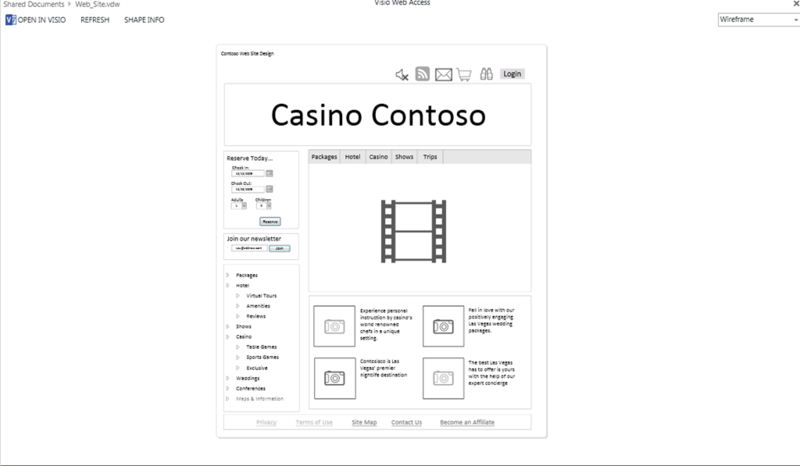 If you want to use these examples along with 30 or 40 more, we have the presentations, walkthroughs and scenarios on Codeplex at http://SharePointDemoBuilds.codeples.com and download / install the Visio Demo 2 Content Pack. San Diego SharePoint User Group (SanSpug) meeting on Nov 6th, 6PM. 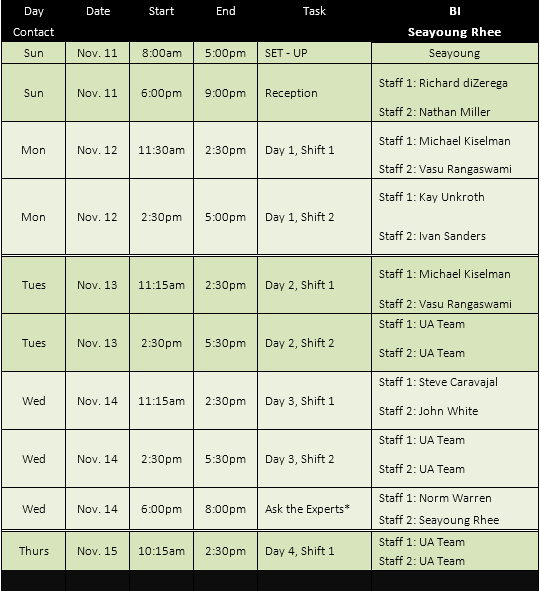 SanSpug meetings are held at New Horizons Learning Centers: Be sure to tell your business colleagues and friends! The San Diego SharePoint User Group (SanSpug) was founded to serve the unmet needs of the Southern California SharePoint Community. We are a formally structured group made up of members and an elected executive team. Meetings are free to attend by all, but access to our more exclusive content and events will be presented only to our valued members. The SanSpug mission is to strive to show and display unique and highly targeted SharePoint content of all flavors. The information you will walk away with from our meetings will always be rich and interesting! Wow, some one tried tell me but I didn’t listen, well at least not closely enough… I would just like to thank my co-authors but especially Norm for being there when I needed a shoulder to lean on and giving me the opportunity to almost kill myself as I lost the plot, working too many hours consulting for too many clients, building the demos for the book and the SharePoint Conference and of course writing… Also thanks to Ken and O’Reilly for believing in me when I almost didn’t believe in myself.. The final drafts go out in two weeks and it will take a couple of months to get on your shelf. 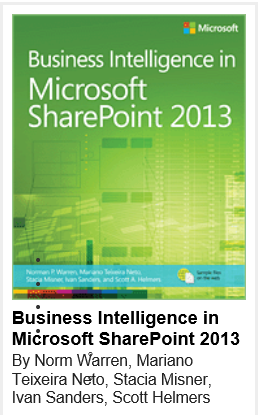 Take control of business intelligence (BI) with the tools offered by SharePoint 2013 and Microsoft SQL Server® 2012. Led by a group of BI and SharePoint experts, you’ll get step-by-step instructions for understanding how to use these technologies best in specific BI scenarios—whether you’re a SharePoint administrator, SQL Server developer, or business analyst. I have said it before and I will say it again its all about friends…. You guys ROCK! 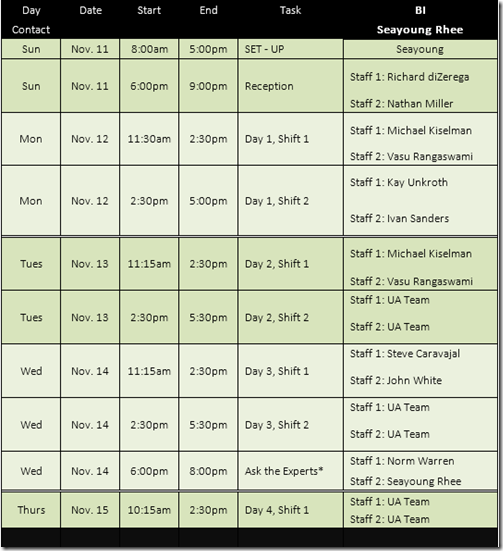 Have a spooky SharePoint day with the Utah SharePoint Users Group! The image shows the end-to-end lifecycle of a project using Office 2013, SQL Server 2012, and SharePoint 2013 to provide business solutions with self-service business intelligence. Norm Warren works for Ancestry.com to help people discover, preserve and share their family history. He is organizer and co-author of a 2nd edition of Business Intelligence in SharePoint for O’Reilly/MSPress. He earned his Master’s degree in computer information technology and recently earned his MBA with an emphasis in financial accounting. He was previously a solution specialist for PerformancePoint Server 2007 and SharePoint Server 2010 at Microsoft. I wish I was there…….. I am very lucky in that I have been accepted to present on Business Intelligence Best Practices at a few upcoming SharePoint Saturdays which I hope all of you will attend. This session is primarily based on walking you through demos on the Design, Development and Deployment of Business Intelligence Objects following SharePoint Best Practices in all aspects from Design to Deployment methodologies of SharePoint 2013. This session will start with a very quick walk through the foundational aspects of Business intelligence when integrated with SharePoint along Best practices in the Design, Development and deployment of Business Intelligence solutions in SharePoint Server 2013, with SQL Server 2012, on Windows Server 2012 that will include Analysis Services Solutions, with PowerPivot, PowerView and Reporting Services, Excel and Visio Services. Also, Norm and Ivan will walk through the governance issues surrounding the deployment of SharePoint 2013 in general and the Business Intelligence Aspects in specific. In addition, Norm will quickly explain practical paths for designing tabular models in PowerPivot and the SQL Server Data Tools environment. He will explain decision points such as hybrid approaches with Direct Query, and include best practices for automating data refresh in SharePoint and scheduling processing in Analysis Services. The session includes a thorough demo of creating an Odata feed from SharePoint lists and SQL Azure to relate a date table for quickly showing aspects of time intelligence. The demo will continue by showing how to create partitions in SQL Server 2012 and schedule data refresh (with an interval of 15 minutes) using XMLA. Lastly, the team will discuss how to choose the right Business Intelligence tools to start using now so you can show immediate results while planning for the future evolution of your SharePoint Business Intelligence Dashboards.. All demos are built on Windows Server 2012, SQL Server 2012, and SharePoint Server 2013. I have been very blessed this year to be working on the Second edition of the Business Intelligence in Microsoft SharePoint 2013 with the illustrious group of Norman P. Warren, Mariano Teixeira Neto, John Campbell, Stacia Misner the author’s of the First edition Business Intelligence in Microsoft SharePoint 2010. Norm currently works for Ancestry.com to help people discover, preserve and share their family history. Norm was previously a writer for PerformancePoint Server 2007 and SharePoint Server 2010 at Microsoft, and has written articles on PerformancePoint Server for the information worker, IT Pro, and SQL Server BI developer audiences. Norm has his Master’s degree in computer information technology and is currently earning his MBA with an emphasis in financial accounting. 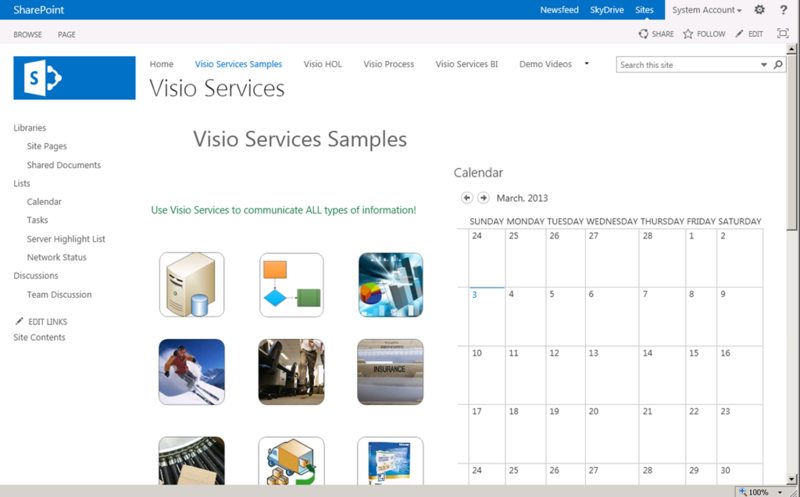 Norm has an active member of the community to provide the right content about Microsoft business intelligence such the SharePoint BI poster (Visio (http://go.microsoft.com/fwlink/p/?LinkId=167409). His past time is with his family, mountain biking, and sharing his passion of BI in SharePoint. If you have been in the SharePoint industry for any length of time you may be able to tell from the number of sponsors with SharePoint products and services, the SharePoint community is getting better very year and becoming more vibrant every day.